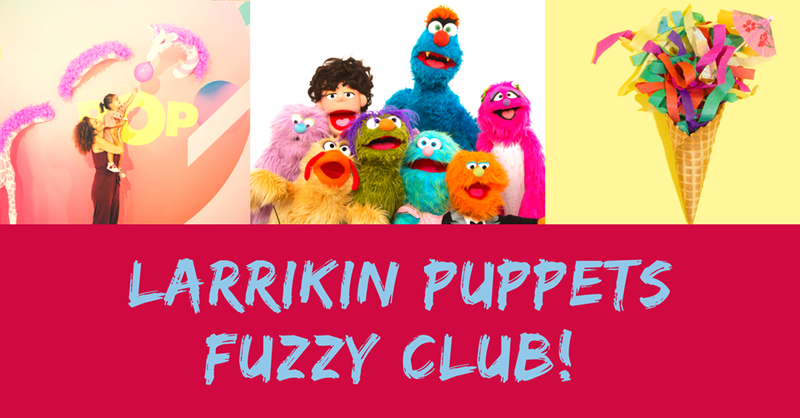 Support us on Patreon: Larrikin Puppets Fuzzy Club! Join the NEW LARRIKIN PUPPETS FUZZY CLUB from just $1/month. NOT. EVEN. KIDDING. Here you’ll enjoy access to our Patreon-only Facebook members group where everything we’re doing gets talked about in detail. You’ll also get some bonus content for kids available only to Patreons. Larrikin Puppets has experienced growth and success beyond its wildest dreams and, for that, we will be forever grateful. We love the impact we’ve made so far on children of all ages all over South-East Queensland through our live puppet shows and puppetry performance workshops. But the current cast of cute, colourful characters are starting to get a bit antsy. They long for something more. They desperately want to talk, dance, sing and interact with more children – children in Australia and all over the world. They also yearn for some artistic freedom! Making quality original puppetry performance art – puppet building, scripting, songwriting and dance choreography – that supports child development is super expensive. But with plenty of public support, we know we can do it! Why? Because learning through reading, talking, dancing and singing is where it’s at. In fact, 90% of a child’s brain development happens in the first 5 years and, in the first few years of life, more than 1 million new neural connections are formed every second. This means supporting Larrikin Puppets is not only wonderful for parents or carers with children, but for anyone who wants to see children across Australia and around the world experience high learning, behaviour and health outcomes. – create original live shows for children with themes around multiculturalism, social inclusion, the environment and kindness/anti-bullying. – write, film and produce an original TV series for children focusing on joy, play, love, kindness, compassion and empathy. – write a CD of original children’s music. – build new original puppets, sets and props. Supporting Larrikin Puppets on Patreon will bring you and your kids joy, laughter and learning PLUS you’ll receive behind the scenes inside scoops into this crazy, colourful world of fuzzy puppets. Together let’s talk, play, sing, dance and interact with fast paced puppet fun! For more info about what we do, visit the Larrikin Puppets website or follow us on Facebook, Instagram and LinkedIn.